This season's Manila FAME 2015 is a huge success, showcasing new talents and designs for the emerging domestic and international market. It is actually one of my favorite Philippine events each year (although Manila FAME is a bi-annual event), it's like fashion week for designs! And it is also my opportunity to discover new talents, proudly displaying to the public eye their winning collection. 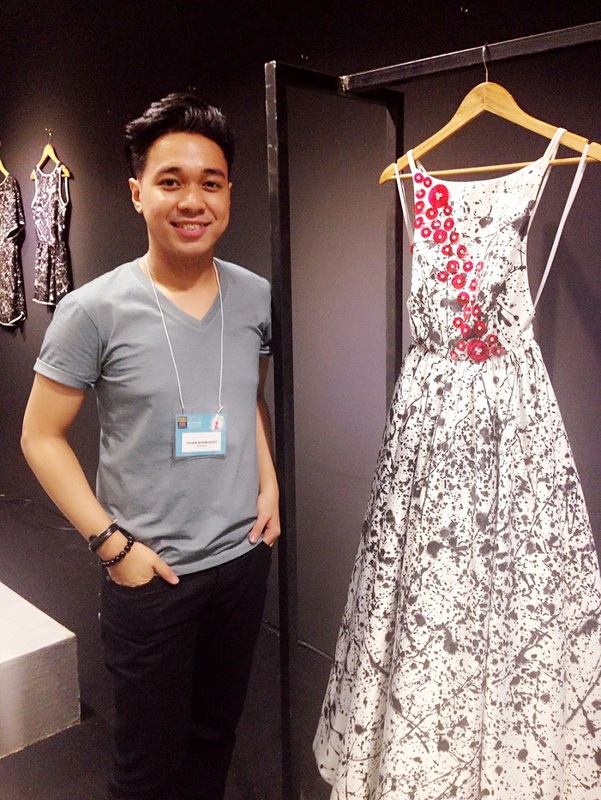 One of the Red Box Design Talents winner for apparel is Thian Rodriguez, a Filipino fashion designer who designs these beautiful pieces, oozing with elegance and glamour. Thian's creations was inspired by the great American artist Jackson Pollock known for his abstract expressionist movement of drip paintings, combined with the designer's passion for anything Japanese. The Sakura (or cherry blossoms) is a symbol of simplicity and mysterious beauty. With the combination of the two, Thian's creations becomes an absolutely stunning. I fell in-love to his DRESS! And I would say that you'll never go wrong wearing with a Thian Rodriguez Dress.